In 1922 Dr. Agnes R.H. Greig, an English surgeon practicing medicine in northern India, was given a female Tibetan Terrier puppy in gratitude for saving a Tibetan woman's life. Dr. Greig was intrigued with the puppy and eventually requested to show her at the Delhi Show in India. 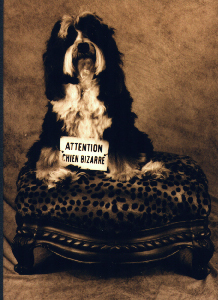 The judges had never seen a dog like this before and suggested that Dr. Greig try to obtain a mate for her from Tibet, and to continue the breeding, to see if the dog bred true. This Dr. Greig did and in 1924 on Christmas Day, the first litter of her golden Tibetan Terrier, "Bunti", and the male from Tibet, "Rajah" was born. Eventually, Dr. Greig showed three generations to the judges and the India Kennel Club. It was decided that this was a pure breed and should be called the Tibetan Terrier although the dogs were not true terriers. On one of her trips back to England, Dr. Greig showed her Thoombay of Ladkok, born in a Tibetan monastery, at the famous Crufts Dog Show in London. He became the first Tibetan Terrier Champion in England. A handsome white dog, he was ten years old at the time. Eventually Dr. Greig left India and returned to England permanently to raise her Tibetan Terriers there. She founded the famous Lamleh Kennels and protected the breed with enormous zeal, even through the difficult days of World War II. After the war several other breeders became interested in the Tibetan Terrier, among them Connie and John Downey who raised and showed the breed under the famous Luneville Kennels prefix. 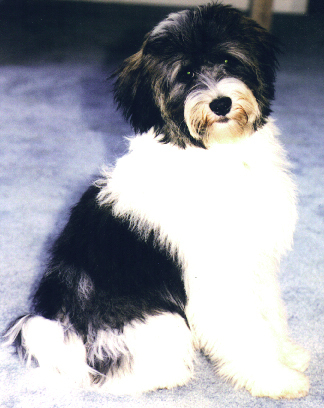 The first "official" Tibetan Terrier in the United States was "Gremlin Cortina," a black with white female imported by Dr. and Mrs. Henry Murphy of Great Falls, Virginia, from the Lamleh Kennels of Dr. Greig. Mrs. Murphy later imported a mate for "Girlie" (as Gremlin Cortina was called.) He was a tri-color named Kalai of Lamleh. The first litter was born at the Murphy's home in 1957, and "Lamleh of Kalai" became the suffix of Alice Murphy's Tibetans Terriers. 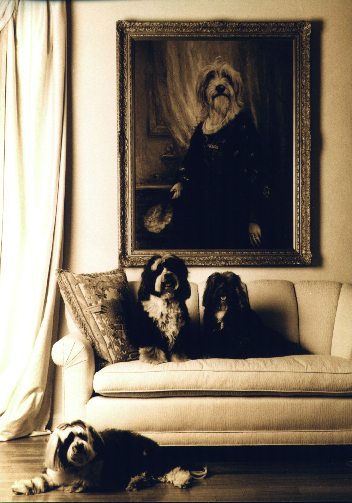 This began a life-long devotion to the breed on the part of Alice Murphy. In addition to her own dogs, she founded Tibetan Terrier Club of America (TTCA)and served as its president from 1957 to 1974. She was a member of the club's Board of Directors until her death in 1976. Photo by Petography, Inc.